The book I co authored with Darlene McElroy is available now. It’s available now in most book stores and through Amazon. 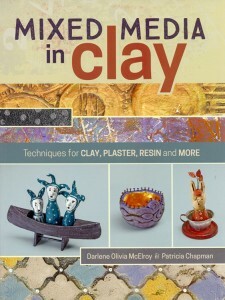 This book explores the use of traditional clay used in non traditional ways, working with resin clay, powdered clay, air dry clay, resin, plaster and more. None of the clay projects outlined in over 50 step by step instructions use an oven or kiln. This is about thinking outside the kiln!